What the hell is there to say about this party? It’s mostly all in the way people dress. Second to how people dress up, there is the beverage list. It’s all a matter of what you can picture a pimp and his ho drinking. Surely, they wouldn’t share the same tastes, as the pimp is more likely able to afford higher end liquor, so you will want to try and have a diversity of drinks. It has absolutely no alcohol in it, but if you can get your hands on the Australian-based “Pimp Juice” energy drink, than you can easily make a variation of vodka and Red Bull. Unfortunately, the only place to find Pimp Juice is through an Australian retailer, which requires an e-mail from out-of-country costumers for details on availability. 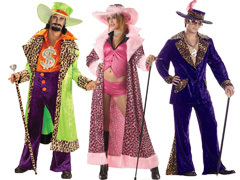 Go to Google Image Search and type in “Pimp Costume”. That’s the easiest way to find a pimp getup for this affair. The stereotypical pimp outfit typically consists of some form of shiny, bright buttoned down shirt (sometimes even animal print), a long velour jacket with pants to match, and one of those massive feathered hats. Expect a lot of this at the pimps and hoes party, as this is how we will always envision pimps. Where variety really comes in is in the color of the outfit. From bright pink to lime green, these costumes and outfits can be found in all various styles. Animal print, stripes, checkered, polka dotted – once you start looking, the options are truly limitless. Whatever you do, don’t forget the cane! Hoes, on the other hand, have a little more freedom when it comes to their outfits. You can go modern hoe, which has plenty of similarities with how most girls dress today, or you can go back in time a little. Check out the beginning of Pretty Woman to get a sense of how you should go about dressing if you’re going for a more 1990’s look. Essentially, it’d be fishnets, ankle-high boots, belly shirts, and short shorts. It’s an easy look to pull off, so you shouldn’t have to go too crazy arranging it.